1. In the 8th issue of his Russian helicopter modelling magazine Heliborne, Yevgeny Borissov has posted pictures of the latest NeOmega resin cockpits, which are #C7216 for the Italeri Ka-52 and #C7215 for the Zvezda 'Ka-58'. 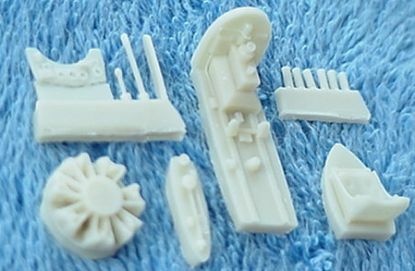 "There are 24 injection moulded plastic parts which are basic but cleanly moulded and adequate. The overall fuselage shape is quite good and certainly looks like an Fl-265 but it is not quite correct in some areas such as the rear of the rotor gearbox cowling and the area where this blends into the upper fuselage. This gearbox cowling is also missing one or two minor bumps and vents. The ribbing on the rear fuselage is represented by raised lines which is probably a better choice in this scale than the exaggerated sagging seen on some kits, and has the advantage that it can be sanded to suit personal taste. The few panel lines on the forward 'metal' half of the fuselage are very fine and I am at a loss as to why the major manufactures such as Italeri can not achieve similar results." "For those familiar with previous Special Hobby helicopter kits, the only 'make it yourself' parts in this kit are for the interior framing visible through the windows. The more detailed parts such as the rotary engine (very nice), seat, cockpit floor (which includes the main gearbox and firewall), pilots controls and instrument panel are provided in crisply moulded resin. I would question whether the protruding resin exhausts are correct for the type of engine cowling depicted in this kit." "The box art illustrates how I believe these should look. 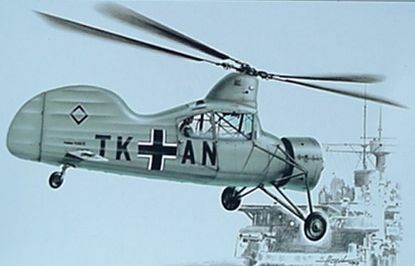 The box art will also prove handy for attending to some of the smaller details such as the fuselage opening for the tail wheel and the area where the rear of the rotor gearbox cowling meets the cockpit roof." "The vacuum-formed transparency is well shaped and mine was blemish free. Hopefully it will be a good fit when cut out." 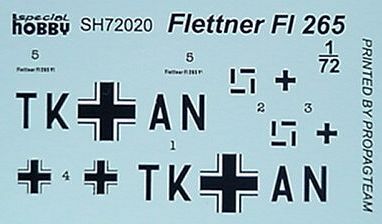 "Decals are for the first Fl-265 (of five built), TK+AN, and are sharply printed by Propagteam. Those contentious tail insignia are supplied as two well thought-out parts. The only dimensions I could find to check scale against were for the rotor diameter which was spot on. In summary, a simple kit which should present few problems during construction and will probably satisfy most modellers." Nice new carpet, Drew. I think we can assume that these pictures were NOT taken in the modelling room ! 3. In response to a query on the rec.models.scale newsgroup, Joe Maxwell replied that "Max Decals has a number of helicopter decal sheets in the works, including the SH-34 of VXE-6." VXE-6/VX-6, the 'Puckered Penguins', was the US Navy's Antarctic development squadron, deployed on Operation Deep Freeze, and included 'King Pin II', seen here before departure for Antarctica on board a USAF C-124 Globemaster. 4. John Wilkes would like to remind us all that there's another world outside of plastic. He has received the latest listing of card models from Scheuer & Strьver, which includes a Sikorsky HH-53C Stallion and Mil MI-17, both in 1:33 scale. John goes on to say that "both these items are available on-line at the above address. Add DM15 to your order for shipping within the EU. This is a standard rate so I would suggest buying in bulk is more economical than individually. Despite this I can say that they are great fun to do, they are relatively inexpensive, and they build into some large and impressive models". See also HKN #64. 5. Latest intelligence in the never-ending saga of the origins of the forthcoming Heller 1:48 OH-58 Kiowa suggests that Heller may have done some kind of deal with Fujimi, as they are currently advertising a re-box of the 1:72 Fujimi E-2C Hawkeye. I think we had better just wait and see. 6. An enquiry about the way the V-22 Osprey folds itself up led me to search for a quicktime video of the process which I used to have. Fortunately there's a copy at Petr Zaoral's Virtual Heliport, which is an absolute goldmine of pictures of rare and unusual birds. You will also need to download the QuickTime viewer from Apple. Thanks to Drew Graham, Yevgeny Borissov, Petr Zaoral, John (Tigger) Wilkes, and Pascal Cholin.